CeLight’s innovations in coherent optical technologies, coupled with a unique, programmable, digital architecture, enable breakthrough capabilities for advanced military, homeland security, and government applications. Over the last 30 years, $100B's have been spent in the commercial and military markets to create and perfect technologies used in the Radio Frequency (RF) domain for applications such as communications, RADAR, signal intelligence and electronic warfare. Key advances resulting from these investments include the use of coherent detection and the migration of processing of RF signals from the analog domain to the digital domain. Yet prevalent optical techniques use analog processing, relegating the optical world to where RF was 30 years ago, thereby preventing the industry from leveraging its previous investments and know-how. Until now, that is. 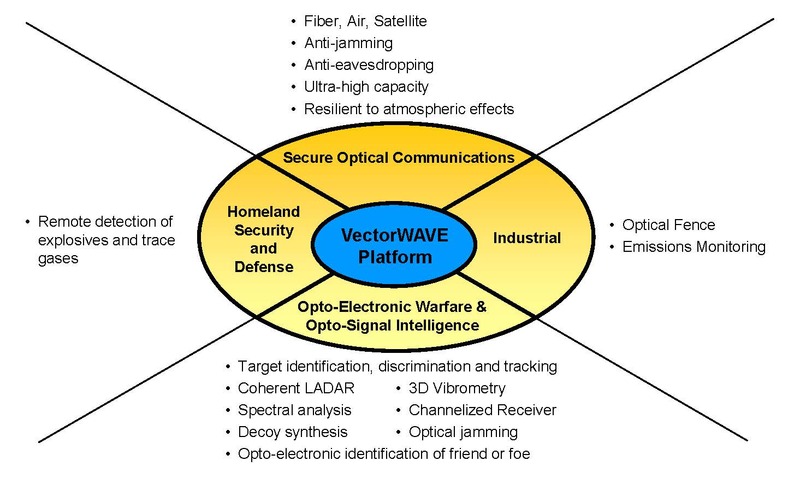 CeLight’s VectorWAVE technology is uniquely positioned to provide a quantum leap by leveraging the RF world’s accomplishments in coherent techniques and digital signal processing to the optical domain. Just like in RF, the VectorWAVE optical transmitter first synthesizes the desired signal digitally. The signal is then converted to an optical waveform and transmitted. The VectorWAVE receiver is unique in that it uses coherent detection and digital signal processing to analyze the received optical waveform. The use of coherent detection allows the VectorWAVE receiver to filter the desired frequency-slice from the optical domain and to linearly convert it to an electrical signal that can then be analyzed using modern DSP technology. For more information, please contact CeLight at sales@celight.com. ©2011 CeLight. All Rights Reserved.